Spring is here and we're happy to share that e-textile expert Hannah Perner-Wilson will be visiting! Hannah Perner-Wilson's work applies conductive materials towards craft techniques to develop new styles of building electronics. Hannah received a B.Sc. from the University for Art and Industrial Design Linz and an M.Sc. from the MIT Media Lab. Since 2006 Hannah has been collaborating with Mika Satomi as the collective KOBAKANT. 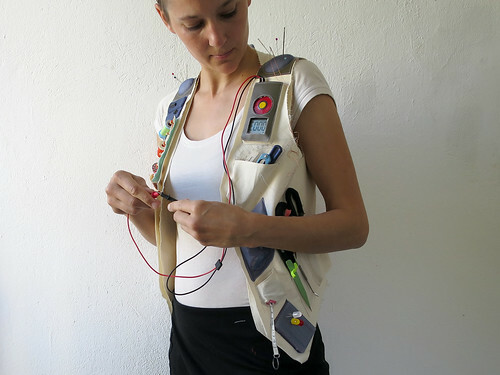 In 2009, KOBAKANT published the website titled How To Get What You Want, where they share their textile sensor designs and DIY approach to E-Textiles. Toronto Wearables Meetup is a gathering of people interested in wearable technology, fashion, wearable electronics, soft circuits, electronic textiles, emerging materials, and other creative and innovative approaches to things that live on the body. This Meetup is a gathering for artists, fashion designers, industrial designers, textile enthusiasts, engineers, researchers, students, and anyone interested in these emerging and intersecting fields. TWM is co-hosted by Izzie Colpitts-Campbell & Kate Hartman and sponsored by Social Body Lab at OCAD University. The theme this month is “How We Make” - a look at the diverse ways in which people prototype wearable tech. Because wearable tech sits at the intersection of many fields and because it is a relatively new area there are not yet set practices and standards for how wearables are produced. Methods can range from hand sewn conductive thread circuits to mass produced printed circuit boards encased in injection molded plastic, and everything in between. This session of TWM will use a show-and-tell format as a way to instigate discussion about how we as a community make wearables. All are welcome to bring completed or work-in-progress prototypes. Let us know if you want us to add your project to the Eventbrite listing so people willl know you’re coming. We’re still working out the details but it’ll likely be circle / round table style, though there will be a projector if you need to show anything on screen. We look forward to seeing how YOU make!